Sea otter pup has found a star fish in the sea kelp to share with it's parent. The seaotter seems to be saying 'hello' from the Pacific ocean. 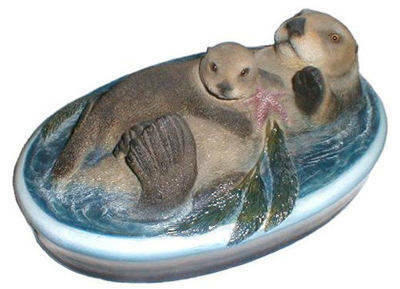 This marine wildlife art sculpture may be the star of your nautical wildlife collection. The sea otter 5 feet (1.5 m) long, weighing 45 - 65 pounds (20-27 kg) is one of 13 different species of river otter and sea otters worldwide. Otter forepaws have retracting claws like a cat. Sea otters have the densest fur of any animal about 600,000 per square inch. Sea otters rely on that fur to keep warm and are especially susceptible to hypothermia from oil spill damage. California (Southern) sea otters are listed as a threatened population under the Endangered Species Act. The southern sea otter population still is small with 2,000 sea otters in only 140 miles (226 km) of the central California coast. The southern sea otter population differs from the Alaska (Northern), and Russia sea otters based on size, weight, and food preferences. Starfish, abalone, sea urchin, and crab are eaten by various sea otters to the equivalent of 20 to 25 percent of their body weight each day. Sea otters are documented diving to 300 feet for 5 minutes. Otters are a young species at 5-7 million years old and are amongst the growing number of animals known by humans to use tools.